A circuit in the foothills behind Hokitika. Excellent views and a nice little hut. 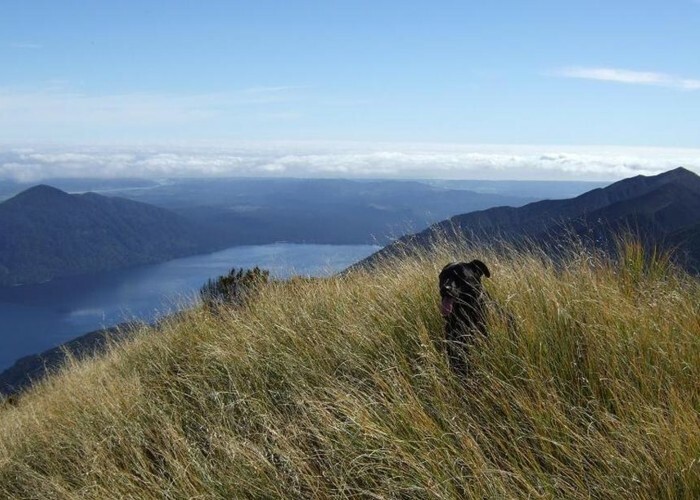 Lake Kaniere etc from top of Mt Brown April 2011 • By glennj. Licence: C.
Styx River car park, Upper Kokatahi Road, Kokatahi, southeast of Hokitika. The original Mount Brown Hut was located near the bushline on the the slopes above the Styx River. The new hut was built as a community project with DOC assistance. DOC was decommissioning the old Lower Arahura Hut, and the plan was to resite and renovate this hut. But with changed building standards and the exposed location of the new hut, not much of the old hut could be saved. 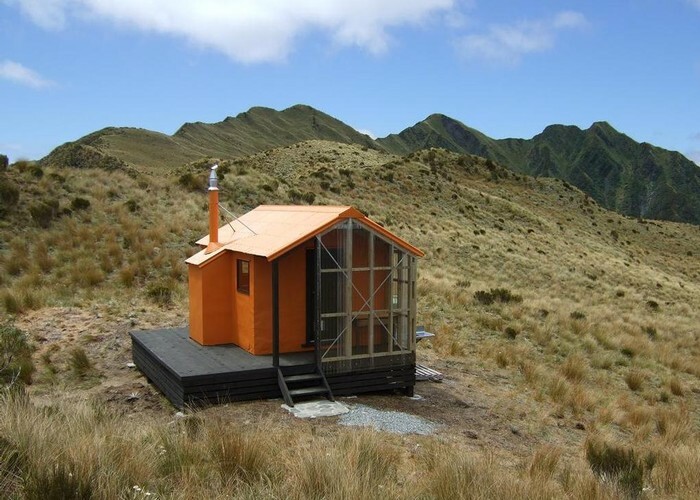 The new Mount Brown Hut is small but welcoming, located on tussock tops with spectacular views over Lake Kaniere and the Browning Range. Two routes lead into the hut. From the south via the Styx River, or from the west via Geologist Creek, and it is easy to make an overnight loop from these two tracks. The tracks are maintained by the Permolat community group, and are a little rough. The Styx route is steeper and not suitable for inexperienced parties. This route involves wading in the river, so is not an option if levels are up. The hut book recounts parties descending the Styx route, finding the river up, and returning all the way to the hut. From Hokitika, drive southeast along Stafford Street, which becomes Kaniere Road, then Kaniere-Kowhitirangi Road. At Kokatahi, turn left onto Upper Kokatahi Road, which becomes Dorothy Falls Road. The Styx car park is marked, just after the second bridge. Geologist Creek is the next bridge, with the turn off to the large car park just before the bridge. Mt Brown hut & beyond Dec 2010 • By glennj. Licence: C.
From the car park, a vehicle track leads over grass flats up the valley. After about 25 minutes, the track runs out as the river pushes under cliffs. Wade along the true right riverbank here and look for a large triangle marker as the track starts up just after the cliffs. An easy stroll through a cutting leads to a creek. Over the side creek (on the true left), leave the main path behind and look for informal markers at the top of the small grass clearing. A sharp spur climbs quickly away from the river then eases onto a forested sloping terrace. At the back of the terrace and over a creek, the track steepens. Eventually, the track passes under large rata trees and reaches the level of the Meharry Spur across the valley. Around here, an old trail leads downhill. Avoid this and keep heading uphill. The track flattens and passes the clearing of the old hut site as the foliage shifts to horopito, cedar, and astelia. Across a bog, the track drops to the foot of a long, narrow slip (the exit here marked with a large orange triangle). Clamber up the slip and exit on the true left near the top (vaguely marked exit). Climb through leatherwood scrub and into tussock. A poled route leads easily uphill over a rolling snow tussock hillside to the hut. The hut is well set up with a verandah and coal fire. It is situated just metres from a deep void with views over Lake Kaniere and out to the evening lights of Hokitika. Mt Brown Hut • Basic Hut/Bivvy (Mt Brown Community Hut Project). Capacity: 4. Added 11 February 2013 by MatthewMatthew. 4 revisions, most recently 24 September 2014 by MatthewMatthew. 1,391 views in the past year (116 per month).